Tinnitus is the perception of sound when no external sound is present. It may present itself as ringing, clicking, hissing, roaring or more rarely, unclear voices or music. It’s not a disease but a symptom that can result from a number of underlying causes such as noise-induced hearing loss, emotional stress, blood pressure/heart diseases, certain medications, head injury, Meniere’s disease and brain tumors. 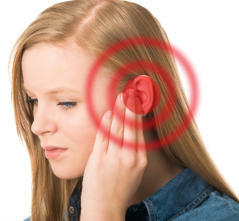 Tinnitus can be exacerbated by smoking, drinking alcohol, consuming excessive amount of aspirin or antibiotics, exposure to loud sounds, drinking caffeine and too much salt. 69% of Tinnitus sufferers are able to find relief with hearing aids. Amplified sound generated by hearing aid stimulates the brain and takes the focus away from the tinnitus. For more information consult your physician and hearing health care professional. © 2018 by Clear Sound Hearing Instruments. All Rights Reserved. Clear Sound Hearing Instruments. Dedicated to Providing the Best Hearing Care.